“The Protector” from Christian Faith Publishing author T. D. Greer is the story of JD Williams; a unique young man who faces the fears and struggles of growing up as he embarks on a challenging quest of self-discovery. JD will experience a summer of firsts as he and his father compete against each other, face death, and confront a bloodthirsty enemy bent on revenge. “The Protector”: a deceptively simple tale of JD Williams and the summer he turns fourteen. “The Protector” is the creation of published author, T. D. Greer. Terry Greer was born on November 21, 1961. He is a 1979 graduate of Poplar Bluff High School, which is located in Poplar Bluff, Missouri. He is also a graduate of Three Rivers College in Poplar Bluff, Missouri. He graduated from Oakland City College in Oakland City, Indiana with an associate’s degree in religious studies. He is a published poet with an Editor’s Choice Award for outstanding achievement in poetry from the National Library of Poetry. Terry has written a number of other poetic pieces along with several songs. In 1980, Terry married Tammy James, his high school sweetheart. They have one son, who is a senior pastor at a local church. Their travels have been extensive. They have been in every State, except Hawaii and Alaska. Their travels have also taken them to practically every province and territory in Canada, except two. Terry and his wife have also traveled much of the Caribbean. His life has been filled with many extraordinary adventures with so many more adventures to come. Published by Christian Faith Publishing, T. D. Greer’s new book is a roller-coaster ride of action, suspense, emotion, love, and family values that will make readers cheer, cry, hold their breath, and feel the chill of death’s icy fingers. JD’s relationship with his father is troubling, yet touching. John is a loving father, but a proud man. He is not quite ready for his son to grow up. He struggles with a lack of father-and-son time. To top it all off, his son is preparing to compete against him. In the back of his mind, he knows the day will come when his son will replace him, just as he replaced his father. It is a summer of firsts for JD, his first kiss, his first time as a real ranch hand, and his first time competing against his own father in a rodeo. It is also the first time JD will face death square in the face when a blood thirsty enemy returns to exact his revenge on the men who work this land. With the help of Red Eagle, a Native American and close family friend, JD learns the importance of nature and how to listen when it speaks. View a synopsis of “The Protector” on YouTube. 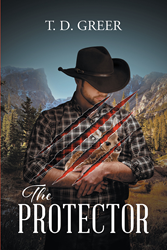 Consumers can purchase “The Protector” at traditional brick & mortar bookstores, or online at Amazon.com, Apple iTunes store, Kobo or Barnes and Noble. For additional information or inquiries about “The Protector”, contact the Christian Faith Publishing media department at 866-554-0919.